Gdańsk is a city in the north of Poland in Pomeranian Voivodeship, near the place where the Vistula river meets the Baltic Sea. It is Poland's 6th largest city (population of 500 000 people) and the largest and most important sea port. It has existed since the 10th century and many times played a very important role in Poland's history. In the 19th century it was part of Prussia. This is where Solidarity, the movement which helped end Communist rule in Central and Eastern Europe, came to life. 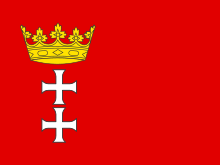 Gdansk has a humid continental climate (Dfb in the Köppen climate classification). The sixth Wikimania was hosted in this city in 2010. ↑ "About Port". Port of Gdansk Authority. Retrieved 2009-11-05. This page was last changed on 18 June 2018, at 23:53.